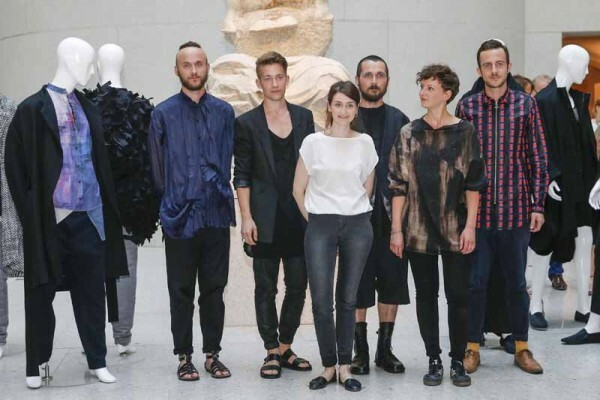 This year marks the 10th anniversary of the European Fashion Award FASH which started out with modest beginnings and gained a lot of strength along the way. The non-profit “Stiftung der Deutschen Bekleidungsindustrie” (Germany Fashion Industry Foundation), in short SDBI, was founded in 1978 by Klaus Steilmann, at the time Europe’s largest manufacturer of women’s fashion. The European Fashion Award FASH competition was launched in 2005, and expanded it to a global level in 2011 thanks to its popularity. In 2008, the foundation’s charitable work was honored by the German government and business initiative “Germany – Land of Ideas”. Six-month funded internship at the Puma headquarters. Our society has surrendered many liberties in favor of supposed security. The goal of the menswear collection “Wie fühlt sich die Spinne auf dem Herrenklo?” (“The Spider in the Mensroom”) is to trigger questions, associations and emotions – whether during observing, reading or wearing the pieces. Lilly Bosse dares to interpret the theme “Freedom” in a very personal way. She also provokes our imagination with her intuitive and associative project, challenges limits and asks questions that used to be realm of stage writers. The inspiration for the menswear collection “The Black Rectangle” is a woman waiting for a train. Kai Gerhardt braved the unknown dealing with the minimalism in fashion. He designed very specific fashion that does not have any connection with a euro-centric male image, yet seems very familiar. The project makes an immediate impression. It distinguishes itself thanks to thoughtful use of materials in addition to an independent design language with a strictly aesthetic system. Wanderlust is not the desire to go on vacation, but the elusive demand to discover something life-changing during a voyage. The menswear collection “Auf und davon nach” (“gone to”) is based on such wanderlust during a seven-month voyage from Ghana to Mali to Mauretania. Ulf Michael Brauner’s menswear collection “Auf und davon nach” (“gone to”) is intense, enigmatic and refreshing, extremely energetic and courageous. In his menswear collection “PXL.” Tomasz Szadel experiments with materials, structures, surfaces and tailoring elements. It is inspired by the process of digital manipulation, between freedom and control. The resulting pixels, structures and surfaces create contrasting patterns, even optical irritations, known as Moiré Effect. The 35 pieces, some with an casual, some with an elegant flair, create ten different outfits; yet can be combined in a variety of ways. The menswear collection “Eine Sequenz” (“One Sequence”) is based on the analysis of a dream shortly before final university exams: anxiety caused by pressure to perform. Lukas Fischer designed 22 pieces in four outfits. Fur symbolizes strength, oversized proportions embody one’s childhood, neoprene and taped seams reflect the surf vacation at Italy’s Lago Di Garda.